The first problem with the cartoon is its crassness. People are still being saved, and it’s making fun of those same people. The second problem is the stereotypes. 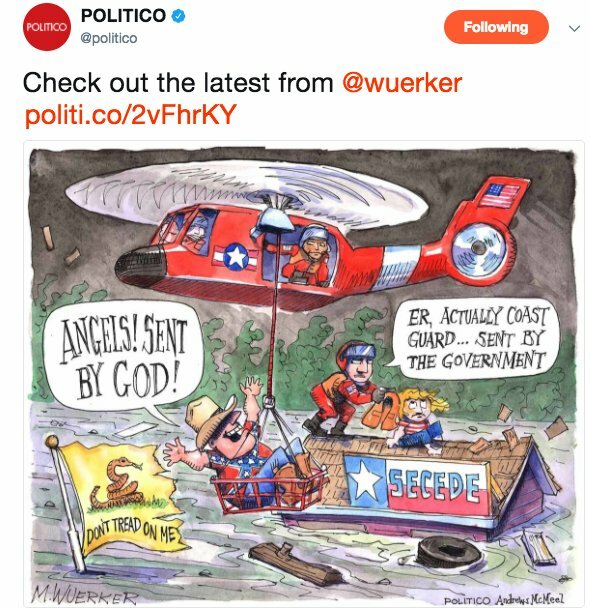 It’s almost a caricature of what you’d expect a liberal cartoonist to draw in response to conservative Texans relying upon the government in their time of crisis. The Confederate flag T-shirt. The Gadsden Flag. The reference to being saved by God (which seems extremely dismissive of Christianity). The Texas secession banner. It’s all kind of … predictable? This overlooks the fourth problem, in my view, which is that it didn’t match what the nation saw. In fact, there was so much of a disconnect that I think he drew (or at least mentally designed) before the hurricane even hit. Instead, what we saw was something different. The (mostly local) authorities did all they could, which by virtue of being not nearly as dysfunctional as New Orleans was not nothing. But people came from all over Texas and Louisiana to lend a hand. Slate can talk all it wants about how this is to be expected, but it’s not what people were expecting. This cartoonists expected fat-asses. A lot of others were gearing up on a wave of expected looting. Instead we saw an awful lot of Texans helping Texans. All of which makes the piece bizarre outside of an exercise in confirmation-bias and, I can’t not say it, cultural sneering. He can say that it was just about secessionists and confederates and only “bad” Texans, but those were the Texans he chose to showcase. Politico would go on to announce the death of Texas individualism, which misses a similar mark in that individualism is not really what we saw. Of course, what is meant is at least partially the federal funds that are about to go the state’s way. 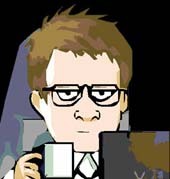 I think it’s completely fair to take Ted Cruz and their congressional delegation to account for their foot-dragging on Sandy relief, and to point out that generally the states rely on one another, but it’s also worth noting that Texas (like NY/NJ) has been paying into that pot for years, and while the temptation is to think that because it’s a red state it takes more out than it pulls in but it’s one of the exceptions to the rule. Not that it should matter. But by all means, rake Ted Cruz and company over the coals if they don’t successfully demonstrate that it actually was about the pork. But leave it at that. Which, I should add, is what people have been doing for the most part. In fact, I have been pretty pleasantly surprised at how few people responded the way that cartoonist did. And the corollary to your fourth problem — it indirectly reinforces the preconceptions about parts of the East held by much of the rest of the country: out of touch, dependent on government, condescending, etc. David Horsey’s column today has a similar cartoon, although not quite so over the top. What’s funny is that as I began to read the excerpt, my mind went to where yours did: this cartoon only works if the attitude/behavior being lampooned actually occurred. And, really, only really works if it occurred on some sort of large scale.